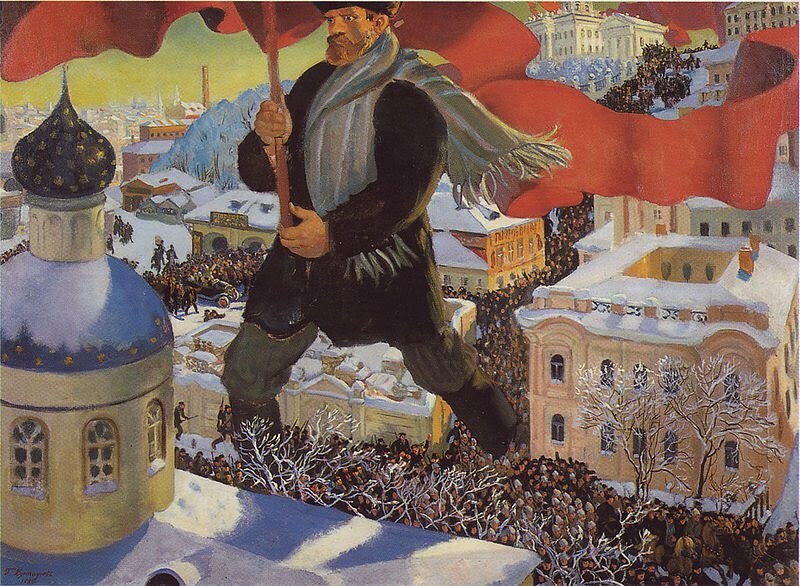 A painting from 1920 by Russian artist Boris Mikhailovich Kustodiev (1878–1927) currently in the possession of The Tretyakov Gallery in Moscow. A component of the security services of the Soviet Union that most outside observers might not take serious note of is the ever-present armed and trained special operations military units that the each version of the Cheka-KGB as well as the NKVD-MVD had at its disposal. The original concept of these “internal armies” or Внутренние войска in Russian (“VV” abbreviated in English), was to be the heaviest hand in the body of the special services. of counterrevolutionaries particularly in Ukraine. Initially, the units were created to enforce the political policies of the Moscow Central Committee of the Communist Party of the Soviet Union and, of course the man who was general secretary of this committee – a title first held by Stalin. Ironically, he was the same person who so greatly abused these troops that continued to exist long after WWII and Stalin’s death in 1953, when the Khrushchev-era “de-stalinization” of the country and the organizations such as the NKVD-MVD and Cheka-KGB began. In fact, these same "VV" troops from the KGB with names such as Alpha Group, Zenith, and Vymple (Russian for "banner" which was the airborne "group") were the vanguard in the assaults in 1979 on the Tajbeg Palace near Kabul that started the Soviet war with Afghanistan. The initial attack organized by the KGB was called Storm 333 in Russian and resulted in not only the taking of the government, but a revolutionary war that lasted nearly 10 years. Even more ironic is the fact that had the Western governments not been so anti-Soviet and backed the USSR instead of the Afghani rebels, Osama Bin Laden and other US-trained militants would most likely never have come to power and the terrorists known as the Taliban would not exist. Of course this is is speculation about what should have and/or could have been. 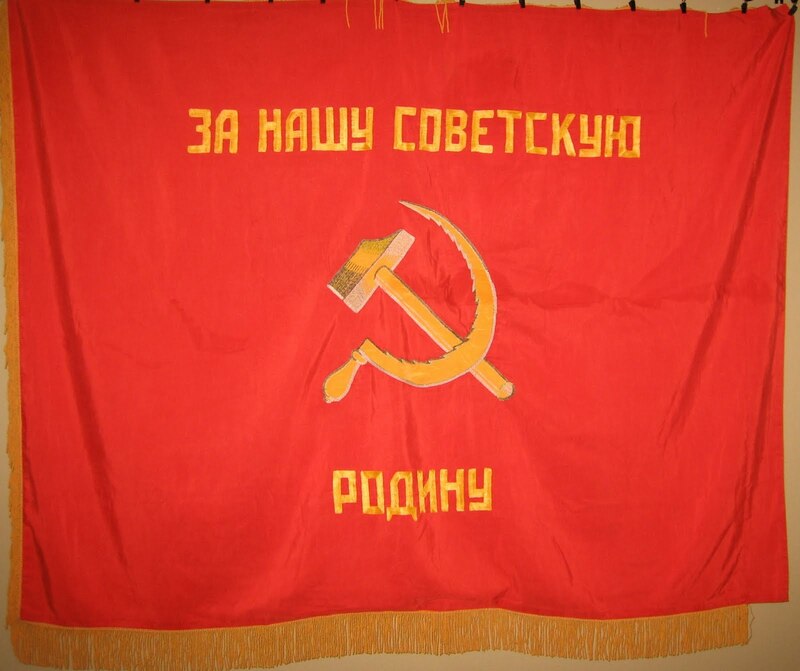 The reverse of the above VV NKVD flag. The VV NKVD troops were used by Stalin to carry out all sorts of highly controversial and very unpleasant actions before, during and after WWII, in part during the “Great Terror” of the 1930s and later post-war divisions were used to suppress anti-Soviet rebel groups throughout Ukraine and newly acquired Baltic States. The Organization for Ukrainian Nationalists was the most renowned and persistent of the rebel groups (see previous chapter dealing with OUN flag and the organization). The suppression took the roles of direct attack, capture and executions or mass deportation by train of whole ethnic populations to desolate regions in Siberia, or wholesale murder of civilians in small towns and villages suspected of collaborating with anti-Soviet rebels. 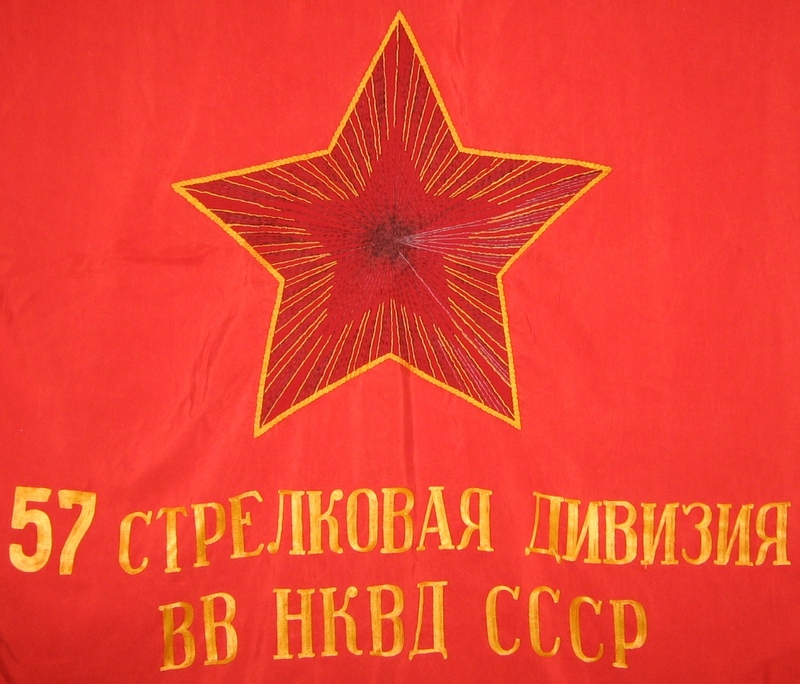 A closeup of the hand-sewn numbers and letters, which consist of several rows of stitching side by side and which simply says the name of the rifle division as explained in the previous photo. It is also easy to see the work of hands on the central star. 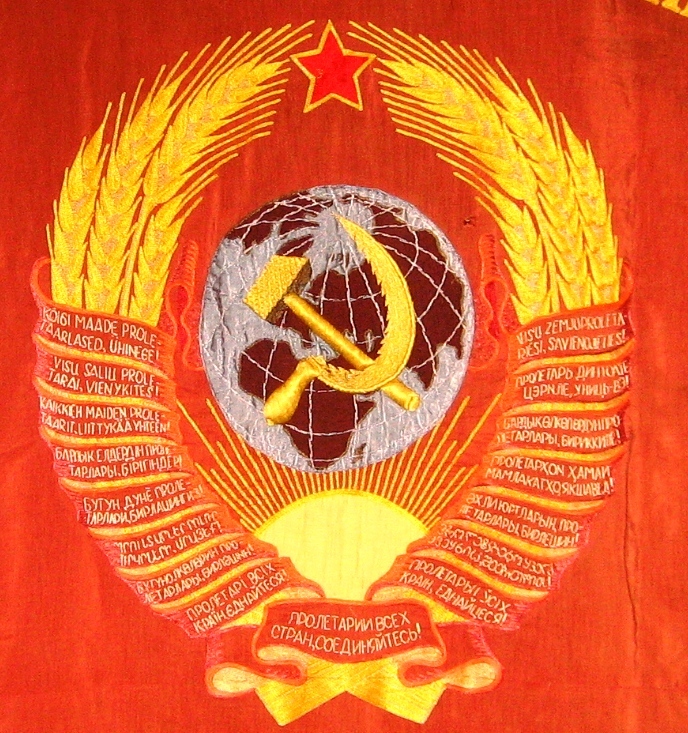 What is interesting about this flag is that it does not have the ubiquitous "Workers of the Country [sometimes translated as "World] Unite" even though there is plenty of room at the top of the front of the flag. 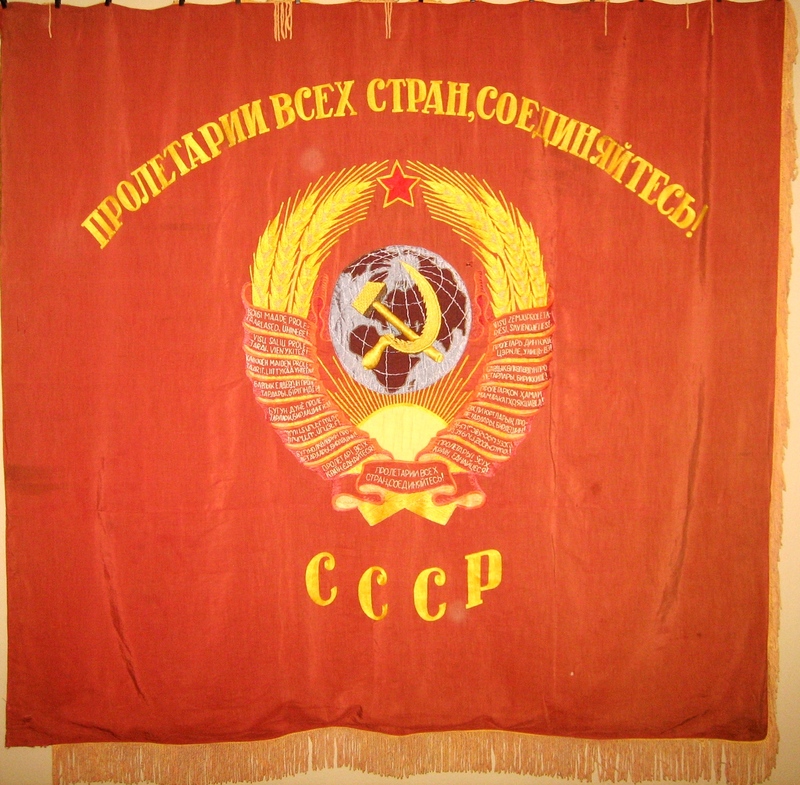 symbol of the original revolution. 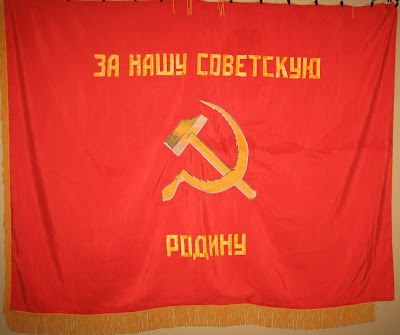 After the war, the foreign intelligence service, the OGPU (All-Union State Political Directorate) which had been subordinated by the NKVD, was once again an independent agency – “Ministry of State Security,” or MGB. They too had a number of “VV” units who also participated in counter-intelligence and espionage elimination of such elements among the counterrevolutionaries. Motherland" sewn in across the top. As the KGB inherited this problem from its predecessor during the Khrushchev era, so it was ordered to publicly back off the hunt and pursuit of rebels. However, secretly, the KGB created new forms of VV units with the most famous called Vympel, Zenith, and Alpha. Each of these special operations units had specific purposes including emergency response teams and by the 1970s, a counter- terrorism unit. Nonetheless, the topic of the KGB and clandestine operations after its inception will be discussed in more detail later. The reverse of the MGB flag with a more standard style state seal and the other, more famous slogan: "Workers of the Country [World] Unite!" 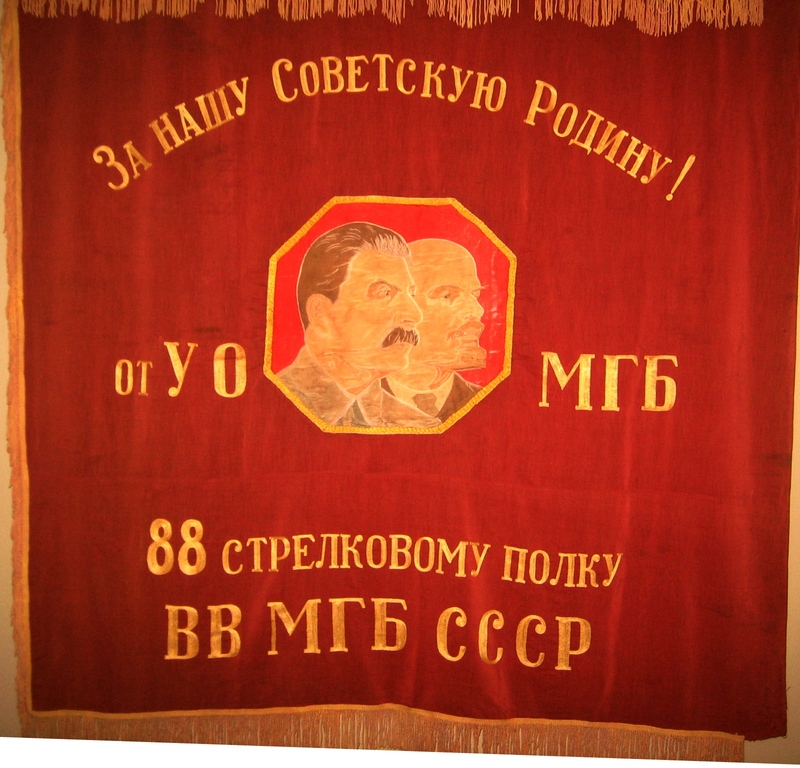 Like the NKVD flag above, the text was created by rows of stitching sewn closely together. 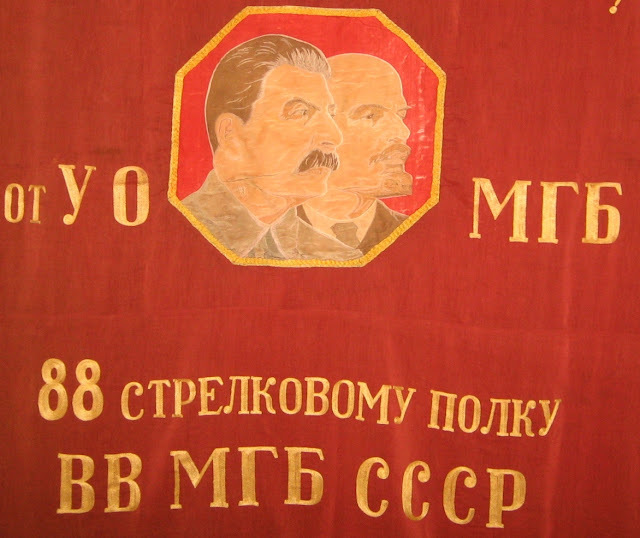 An all-sewn rendition of Stalin and Lenin on silk is inside the octagon in the center of the flag. A closeup of the state seal sewn into the reverse of the MGB flag with 16 republics represented by individual banners or "ribbons" each with "Workers of the World [Country], Unite!" in each of the constituent native languages of the republics. This version of the state seal only existed from 1946-1956 until the country was re-divided into the final 15 republics that existed until the union was dissolved in 1990. "Honored State Security Employee" - the highest award given by the KGB to its very best agents. These awards were numbered to identify who was given the award. Unfortunately, records from the KGB archives are unavailable for researchers to identify agents via serial numbers on awards. This badge is numbered 1755 and was probably awarded in the early to mid-1960s. Based on the serial numbers of observed badges of this type, fewer than 10,000 of them were awarded between 1956 (the first year this type of badge was given) and 1991. The Komitet Gosudarstvennoy Bezopasnosty - Комитет государственной безопасности - "Committee for State Security" was given its final name in 1954. 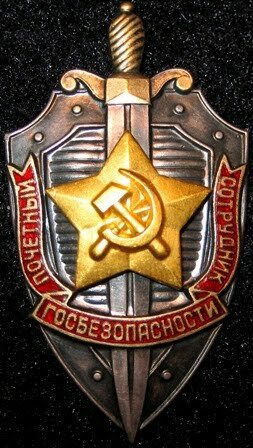 CLICKING ON THE PHOTO OF THE BADGE will take the reader to a thread in the Soviet Military Awards Page Forum written by me using examples from my own collection which goes into great detail about the other KGB badges, namely the anniversary badges. Please have a look. Mongolia, though never an actual republic of the USSR, was one of the closest allies from the earliest days of the Soviet Union. Their system of government was based almost entirely on that of the Bolsheviks - especially the Cheka. 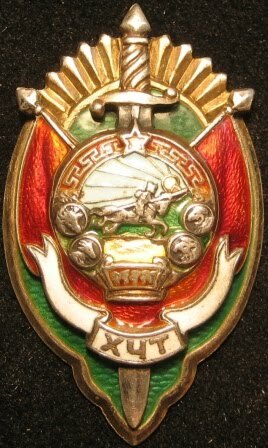 This is one of earliest badges awarded to select Mongolian security service agents and is the highest award possible for members of the organization - much like the Honored KGB badge above. This badge is probably from 1924-1927 and is the second generation or "type" badge (the organization was founded in 1922) of its kind. Like many early Mongolian awards, it was manufactured at one of the Russian mints, typically in Moscow. It is solid silver and designers/makers used plenty of high quality enamels creating the "sword and shield" and small "banner" motif that remains popular in many countries - both FSU and others. 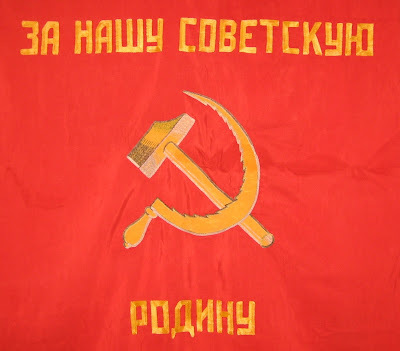 Soviet Authentications by "Nota Bene"
Writer and student of 20th century Russia and the Soviet Union with an emphasis on state security agencies of various Warsaw Pact countries from the Cheka to the KGB and the agencies it helped create from Mongolia to Poland. 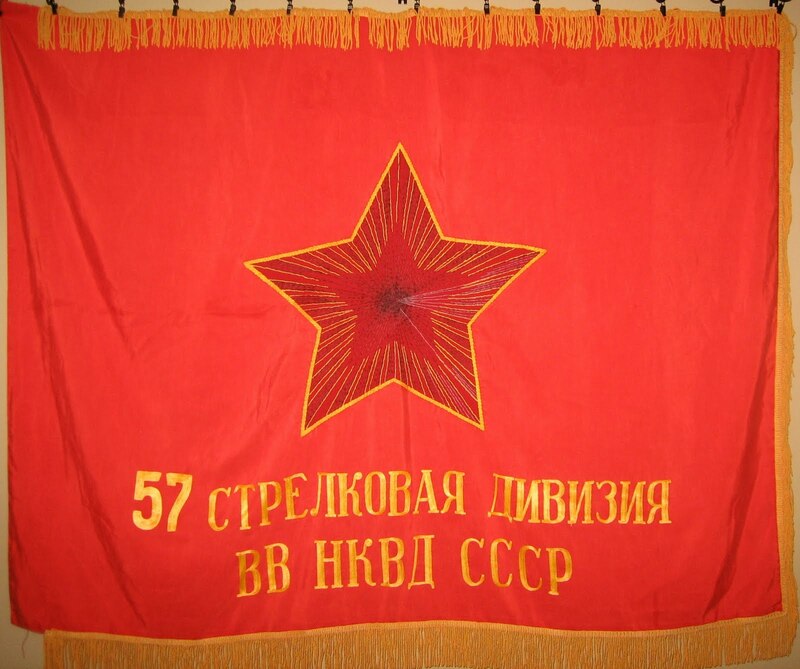 I am also an avid collector of Soviet era security service awards and documents with a particular interest in the functioning of the KGB as a means to maintain the political and social power of the Communist Party of the Soviet Union during the Cold War. All Content Copyright © 2010, 2011 Phillip de Valcourt except where otherwise cited. Travel theme. Theme images by mammuth. Powered by Blogger.